Consider your dinner from last night. Maybe you had a chicken sandwich or veggie burger accompanied by fries. Now, think about your meal’s start on the planet. What do you really know about its journey to your plate? 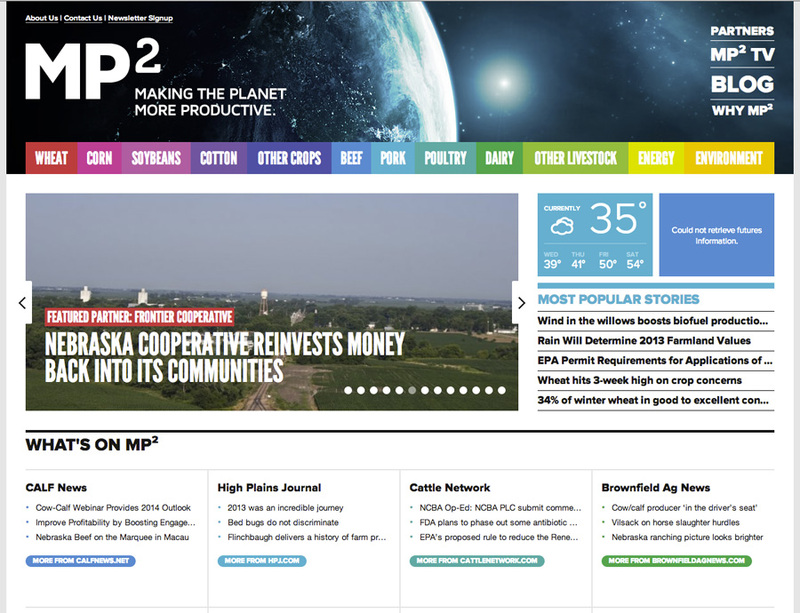 Educating the general public about the intricacies of the agriculture business is only one of the things that MP2 Communications aims to do through its one-year-old website, mp2.ag, which recently received a 2014 AVA Digital Platinum Award. Recently I was able to learn more about the site’s creation and challenges faced during development from Mark Vierthaler, director of MP2 Communications, a division of Servi-Tech, Inc.
Tell me about MP Squared’s mission and what visitors can find when they visit mp2.ag. MP Squared’s mission is to make the planet more productive, which is where the name comes from: Making the Planet More Productive = MP2. The more in-depth answer is that mp2.ag was created in an effort to help bridge the gap between those who consume the products of agriculture (i.e. everyone) and those who produce the products that are consumed (only 1.8 percent of the United States’ population). This was developed in close conjunction with people who have worked in all sides of the agricultural industry including traditional and organic. The goal was to create a site that both agriculture industry professionals AND everyday consumers could come to and learn about every single aspect of the industry in clear, concise, and factual ways. It’s an agricultural news hub. Up-to-date news feeds from more than two dozen agricultural news organizations are automatically pushed onto the mp2.ag home page. This way, instead of scouring the Internet for the most recent ag news, users just have to visit one page and get a quick overview of everything going on. It’s an education tool. The tabs across the top of the site link to pages about different areas of agriculture. This helps consumers get a better understanding of what exactly their food is and how it’s produced. We find partners within all areas (production, transportation, fuel, energy) who want to tell their personal story about how they make the planet more productive. This humanizes an industry that many see as faceless and monolithic. The design came mostly from original ideas with some ideas borrowed from news aggregate sites like AllTop or the Drudge Report. We knew going in that we wanted a site that was graphically pleasing, easy to navigate, but really had the content chops to serve its function and not just look pretty. It was the content and the ease of navigations that we really wanted to focus on. We went through about four or five pre-design mockups before we approached Brookside Studios, our web design partner in Tulsa, Okla. Damon DoRemus and his team took our ideas and really made it work and shine. The behind-the-scenes CMS is pretty outstanding, as well, with an easy-to-use interface that lets us easily change up every single piece of the site. After Brookside Studios had our mockups and requested functionality, they put together a basic version of the site. MP2 Communications then set about generating all of the content. Every single piece of content on the site was created in-house (unless otherwise noted), so we wrote every piece, shot every photo, and put together every video. As each section came together, we would integrate it onto the site with Brookside Studios and ensure that the site was still functioning how we wanted it. It officially launched January 1, 2013. As I’m sure you know, the agricultural industry has become a very politically charged bit of business in recent years. We wanted to make sure that the site was a true representation of every aspect of the industry (including organic and traditional) so consumers could have a safe, low-key place dedicated to answering all of their questions. As such, that means doing tons of research on a wide gamut of areas, many of which we didn’t have intimate knowledge of. We did the majority of research through academic articles, as well as first-person interviews with people who are active in the agricultural industry. We then had a series of partners that were our fact checkers – for example we had several agronomists from Servi-Tech, Inc., fact check our pieces to ensure that while they were easy to read, they were still factually accurate. Were there certain aspects that you knew had to be integrated into the site from the start? Death to jargon, death to jargon, death to jargon. There’s a double-edge sword in the communications world. The more you know about a subject, the more accurately you can discuss it. However, the more accurately you discuss it, the more technical terms and jargon creep in. The more technical terms and jargon that creep in, the harder it is for the general public to understand it. Now, that’s not a big deal when you’re working on internal communications, or you’re specifically targeting a group of people with intimate knowledge of your subject. However, if the goal of your site is to connect and inform consumers and/or those with little experience in the industry, jargon is your enemy. While you may be as accurate as a lifelong industry professional, you’re losing the audience you want to reach. So, the ultimate goal was to create something accurate, easy and interesting to read but not overly complex. What do you hope visitors walk away with? We hope people realize that the agricultural industry is much more complex than they may have thought in the past. This was our baby for about a year, actually. As mentioned, all of the content was written, photographed, etc. by myself and my assistant director Monica Springer. 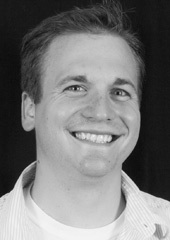 All of the web work and design was done by Damon DoRemus and his team at Brookside Studios. The idea originally came up about four years ago when I first left journalism to enter the world of public relations and marketing. The company that hired me was an agronomic firm, and as my previous experience had been as an investigative crime journalist, I didn’t have a lot of knowledge about the industry. While doing research, I was somewhat stymied by the lack of a one-stop shop for ag information. It was either much too complex (“Some guys are substituting Lorsban for dimethoate.”) or much too simplistic (“The cow goes moo.”). There really wasn’t anything that could offer a simple but mature bit of information. What’s ahead for MP2.ag in 2014? When we launched a year ago, we mainly hit on the main areas of agriculture (i.e. the crops and livestock production practices that dominate the United States markets). However, that is only scratching the surface of everything that’s produced in agriculture and how every single aspect of your life is impacted by people in the industry. In 2014 we have a list of expansions that will include things such as equine production, as well as the history of the organic movement and where it differs from traditional agricultural practices. We are also overhauling the blog. We have a great list of bloggers from various areas of the industry; however, the blog itself isn’t as easy to navigate/browse as we’d like. We’re also expanding the categorization of partners that want to tell their story. Starting in mid-2014 partners will start being divided up into the area of the industry they’re most involved with (i.e. seed production, coops, transportation, etc.). And while we have lots of good information, we’d like to start digging down into more complex topics so as people become more familiar, they can educate themselves even more. Finally, video production is going to more than double this year. We’re in the process of producing a series of videos that takes each crop, cow, etc. and shows them from beginning to end. “Gate to plate” is the term most often used.